Why decide between having pets and having nice furniture? 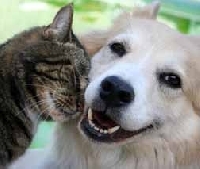 Pets make good friends and great companions. They are a form of stress relief and help their owners live a happier, healthier life. Pet owners would do almost anything for their furry friends, but animals don't always make life easier. Some animals take longer to adjust to a new home than others, and some older animals retain bad habits. But just because we have pets, doesn't mean that we can't have nice furniture. It is, in fact, easier than one would think to train cat claws and dog teeth not to see your furniture as a toy. Furniture and pets can work together if you take measures - like sticky tape, slipcovers and bitter apple - to protect your furniture from your pets. Scratching post: Cats need to periodically shed the outer shell of their nails in order for the new nail growth to come through. Giving your cat an appropriate place to sharpen its nails will deter it from resorting to furniture. If your cat seems unwilling to use the scratching post, try putting a little catnip on it for encouragement. Trim the nails: Everyone knows that dogs need their nails trimmed, but this is just as important for cats. Keeping your feline friend's nails trimmed will cut down on its need to scratch and help protect furniture. Water: If you catch your cat sharpening its nails on your couch, try squirting it with water from a bottle. Cats hate water, and they will equate scratching the furniture with getting wet. Sticky furniture: Double-sided tape that leaves no residue on furniture can be purchased at most pet stores. Put this tape on your cat's favorite scratching spot. When your cat tries to sharpen its nails, it will touch the sticky tape instead of the side of the couch. Your cat won't like this feeling, and it should take only about a week or two for the cat to leave your furniture alone. Toys: Just like the scratching post for cats, giving your dog something to chew on should deter it from chewing on chair legs. Toys that are made of hard plastic are the best for heavy chewers; it will not only give your dog a workout while chewing, but they also last longer than other chew toys. Leg covers: Try wrapping towels around wooden chair and table legs to protect furniture while your dog is in its chewing phase. Anti-chew chemicals: bitter orange, bitter apple and other commercially available, foul-tasting solutions will deter your puppy from chewing on furniture legs, baseboards, molding and other items in your house. Loud noises: Cats and dogs both dislike loud noises. When you see your pet misbehaving, try smacking a rolled up magazine or newspaper in the palm of your hand. Your animal will associate this wrong deed with an unpleasant noise. Retrain: When you see your cat scratching the furniture, immediately pick it up and place it by the scratching post. This will let your cat know that the scratching post is an acceptable place to sharpen its nails. With your dog as well, when you see it chewing on furniture, give it a chewing toy instead. Slipcovers: If your furniture worries are something other than chewing or scratching, slipcovers are an excellent resource. A slipcover will protect furniture by keeping hair and dander off of your furniture. What's better, a slipcover can be easily removed and placed in the washing machine. With a little training and perseverance, you won't have to decide between pets and nice furniture. Your animals and your furniture can live happily together.